Nathaniel Tablante, Extension Poultry Veterinarian and EDEN Point of Contact, University of Maryland College Park, attended this conference on EDEN’s behalf. Below are his takeaways. 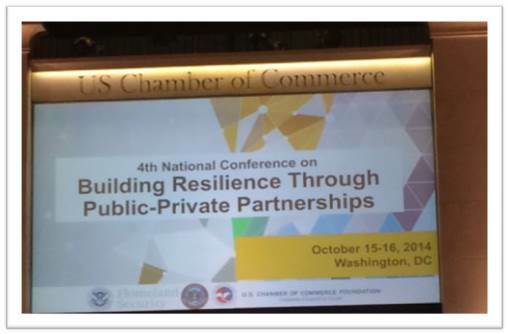 The 4th National Conference on Building Resilience Through Public-Private Partnerships was held on October 15-16, 2014 at the U.S. Chamber of Commerce headquarters in Washington, D.C. I represented EDEN and I am grateful for the opportunity to do so. This annual conference is a partnership between the U.S. Chamber of Commerce Foundation, the U.S. Department of Homeland Security, the Federal Emergency Management Agency, and U.S. Northern Command. This year’s agenda focused on our interconnected world, from neighborhoods to the global partnerships. Speakers discussed evolving risks to the infrastructure that powers, transports, informs, and otherwise connects organizations and the people they serve. Discussions involved emerging issues such as climate adaptation and cybersecurity, as well as innovative efforts to leverage philanthropy, technology, trained corporate volunteers, and information-sharing networks through public-private partnerships. It was good to see many representatives from both the government and private sectors as well as academia participate in lively and productive discussions on various ways to strengthen disaster resilience though public-private partnerships (P3s). Secretary Jeh Charles Johnson of the U.S. Department of Homeland Security delivered a powerful keynote address, “The Road Ahead to Partnership.” He stressed the importance of public-private partnerships to homeland security. In particular, he pointed out that the American public is very anxious about the threats posed by ISIL and Ebola and encouraged calm, meaningful dialogue among public officials, the private sector, and the media regarding these threats to national security and public health. The first session, “The Evolving Threat Environment,” involved three panelists, Thomas Fanning (President and CEO of Southern Company), Keith Squires (Commissioner of the Utah Department of Public Safety), and Francis Taylor (DHS Under Secretary for Intelligence and Analysis). This unclassified briefing presented emerging threats from the perspective of government intelligence leaders, risk experts, and corporate CEOs, and set the foundation to examine how preparedness and resilience efforts can reduce the likelihood and/or impact of these threats. Gen. Taylor provided a government perspective on threats to national security. He stated that the Al Qaeda core and its affiliates continue to be a major threat to the U.S. with aviation as the number one risk. He also warned that ISIL is a terrorist and military organization that has a Westernized propaganda arm that appears to be very effective in recruiting Westerners who become “lone wolf” threats. He stressed the importance of understanding threats at every level and that sharing information with local enforcement agencies is critical to the successful mitigation of these threats. For his part, Mr. Squires shared the State perspective on threats to national security. He cited that information sharing is critical to homeland security. He mentioned that there used to be a government monopoly on information on threat activity with absolutely no information being shared with the private sector prior to 9/11. He emphasized the vital role played by post-9/11 Fusion Centers, a “collaborative effort of two or more agencies that provide resources, expertise and information to the center with the goal of maximizing their ability to detect, prevent, investigate, and respond to criminal and terrorist activity.” Mr. Fanning shared the private sector perspective and pointed out that cyber and physical threats are inseparable and recommended a “bottom-up, top-down” approach to addressing these threats. He also stressed that good corporate governance is the key to success and that everybody has the capability to deliver goods and services when necessary. Gen. Taylor shared a final thought on the importance of educating business and local leaders about risks and threats to national security. He mentioned that “low probability, high impact” events happen every day but we never prepare for them. Mr. Fanning also pointed out that threats are not fixed but continue to evolve and mutate, therefore we should be flexible and focus not only on preparedness but also on rapid response. The second panel discussion, “The Interconnected World: Challenges and Opportunities,” involved William Beary (Chief of Engineer Operations, NORAD), Shoshana Lew (Deputy Assistant Secretary for Transportation and Policy, DOT), and Nick Shufro (Director of Sustainable Solutions, PricewaterhouseCoopers). This panel discussed evolving approaches to risk management and innovative ways that the private sector and government can engage and collaboratively prepare and protect their organizations and communities from the threats outlined in the previous panel. Two breakout sessions were held in the afternoon of October 15. The first set of breakout sessions focused on “Badging and Credentialing,” “Bridging the Cyber/Physical Connection”, “Business Continuity and Corporate Philanthropy: Why Resilience is Good for the Corporate Will”, and “Technology and Voluntary Capabilities.” I attended the “Technology and Voluntary Capabilities” session which involved Rakesh Bahraini (West Coast Lead, Cisco Tactical Operations), Deanne Criswell (Incident Management Assistance Team Lead, FEMA), Harmony Mabrey (Senior Operations Manager, Microsoft Disaster Response), Andrew Rasiej (Chairman, NY Tech Meetup), and Ted Okada (Chief Technology Officer, FEMA) who moderated the session. This session explored the role of technology volunteers in disasters as well as collaborations with government and non-government organizations focused on community resilience. Mr. Bahraini of Cisco cited the numerous benefits of involving company employees in disaster preparedness and response, among which are boosting employee morale, doing something tangible, and increasing employee retention. Mr. Okada of FEMA cited that the critical needs during disasters are volunteers and equipment such as cables and routers. Ms. Mabrey of Microsoft stated that employees want to get involved in this effort anyway so volunteers are always available. The panel agreed that Best Practices standards are essential, including pre-credentialing of volunteers and having a reserve of equipment. The second set of breakout sessions focused on “Driving Mitigation and Resilience,” “Cross-sector Collaboration Opportunities Using Critical Infrastructure Big Data Analytics,” “Business Emergency Operations Centers – Maximizing Coordination at the State and Local Level,” and “Volunteers and Donations.” I attended the session on “Driving Mitigation and Resilience” which involved Michael Grimm (Director of Risk Reduction Division, FEMA) and Sean Kevelighan (Head of Government and Industry Affairs, Zurich North America). Mr. Grimm opened the session by stating that resilience is the ability to act on information. Mr. Kevelighan assured everyone that although insurance usually kicks in after a disaster, insurance companies such as Zurich are also involved in mitigation and risk assessment. He shared Zurich’s program on global flood mitigation and stressed that his company spends a lot of money on information gathering and risk modeling. He also pointed out that Zurich educates consumers on how to mitigate risks. The second and final day of the conference started with a recap of the previous day’s session. The discussion was led by Assistant Secretary Caitlin Durkovich, Office of Infrastructure Protection, U.S. Department of Homeland Security and Director Randel Zeller, J9 Interagency Directorate, NORAD and USNORTHCOM. This brief recap was immediately followed by a panel discussion, “Public-Private Partnerships in Action” which was moderated by Dr. Mark Troutman, Associate Director, George Mason University School of Law’s Center for Infrastructure Protection and Homeland Security. The panelists included Susan Maybaumwisniewski (Vice President, Policy, Business Executives for National Security), Seth Miller Gabriel (P3 Analyst, Institute for Public Private Partnerships), John Odermatt (Managing Director, Office of Emergency Management & Fraud Surveillance, Citi), and Michael DeJong (Mational Cybersecurity Branch, Canada). Mr. Odermatt stated that an all hazards approach works best for companies and localities and must include cyber events. Mr. DeJong reported that Public Safety Canada has a cybersecurity branch and that the biggest indication of a cyber-attack is its physical initiation. Ms. Maybaumwisniewski commented that the government can partner best with industry through planning and organization. Mr. Gabriel stressed the need for political leadership in order to extend resources to educate the right people. The last panel discussion was a “Leadership Roundtable” involving a Q&A session with Robert Griffin (General Manager for i2, Threat and Counter Fraud Business Unit, Information and Analytics, IBM Software Group), Andrew Guzzon (Vice President, W.W. Grainger, Inc.), and Susan Hartman (Sr. Group Manager for Corporate Security Strategic Partnerships, Target). Russ Paulsen (Executive Director, Community Preparedness and Resilience, American Red Cross) moderated the session. Q: (Paulsen)- How do your companies approach resilience? A: (Guzzon) – Resilience is about communicating when an event happens. We help each other after an event and make sure that the supply chain is robust. We help the community and first responders. (Hartman) – We think about it holistically as a team. We focus on educational awareness of our employees and strategic partnerships with the community which also meets our business objectives. Our team also practices for earthquakes and other natural disasters. (Griffin) – IBM is a big company. We have a global and local crisis management team as well as a pandemic team for diseases such as bird flu and Ebola. We conduct table top exercises annually, provide essential support to our clients, and partner with government agencies such as the FBI. Q: (Paulsen) – What are the keys to the success of P3s? A: (Guzzon): Give yourself the ability to adapt to a changing environment—be flexible. Think of other things to do in times of disasters [other than the routine activities]. Invest in each other’s success. (Hartman) – It all comes down to people. Focus on increased networking and the opportunity to connect. (Griffin) – It’s all about relationships and people. As a corporation, make sure you are essential to what your clients do. Help solve local community problems. Identify critical areas to sustainability. Our guiding principle is “resiliency by design”, i.e. adapt to the local situation. Identify risks and liabilities and what you can do to address those. (Hartman) – Businesses need resilient communities in order to thrive. (Guzzon) – We are very customer-centric in California. We keep it simple. We keep the “invite” going. Q: (Paulsen) – What is it that made you come here [to this conference]? A: (Guzzon) – It’s personal because we have employees who lost their houses [during the forest fires in California]. We won’t exist if we don’t have stable and safe communities. A: (Hartman) – We have a long-standing commitment to the community. We need communities in order to thrive. A: (Griffin) – It’s about giving back to the community. It’s also personally gratifying. The character of a company is not built during good times but during bad times. Wrap-up (Paulsen) – There is no “one size fits all” for public-private partnerships. We have to be more inclusive and get more involved in joint planning for disasters.